Harajuku girl wearing a colorful layered vintage style with layered tops, layered skirts, white boots, yellow net tote bag, a rainbow newsboy cap, and layered necklaces. 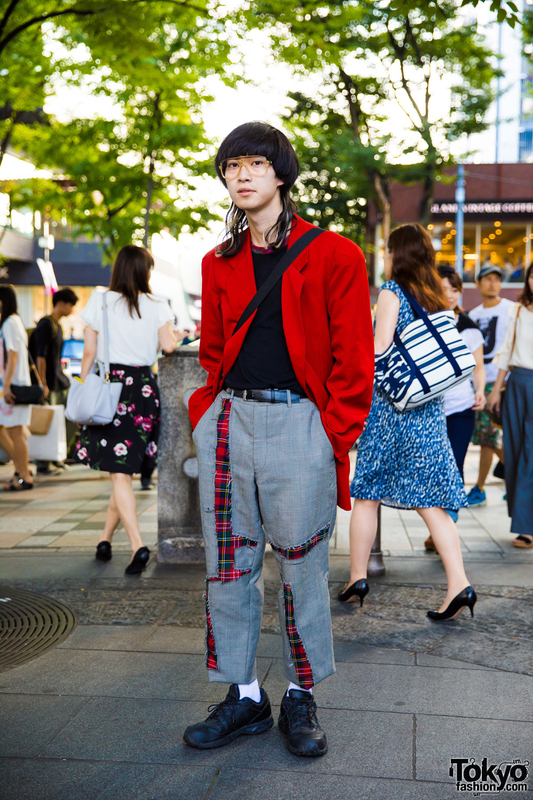 Harajuku freelancer wearing red blazer over a black shirt, cropped pants, black sneakers, net sling bag and glasses. Harajuku girl with cute bob hairstyle, printed dress, sheer top and Tokyo Bopper rocking horse shoes. The vocalist for the Japanese noise band Negative Climax wearing a crumbled hat, white jacket, skirt, and sneakers on the street in Harajuku. Cool guy in Harajuku with large sunglasses, plush jacket, chain jewelry and fringed scarf.